Ideal for manual erythrocyte, leukocyte, platelet, eosinophil and sperm cell counts. The disposable CELL-VU® Hemacytometers consists of a standard (3 x 1″) specially-designed glass slide and coverslip. Disposal of the entire apparatus eliminates cleaning and minimizes clinician exposure to body fluids. Both the slide and coverslip are marked to ensure correct use. Each slide is dual-chambered (allowing for 2 determinations) with a printed inert surface that creates a 0.50 µL chamber volume. Chamber depth is 20 µm, optimal for cells to form in a monolayer. Centered on each coverslip is a laser-etched grid. The 3 x 3 mm grid is a modified pattern of the Neubauer Ruling, divided into 9, 1 x 1 mm counting areas. Each counting area is subdivided to facilitate specific, accurate results for the cell type being counted. The center square of the grid is subdivided into 100 counting areas and is used for erythrocyte, platelet and sperm counts. 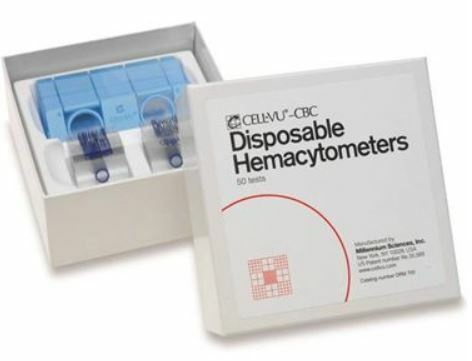 CELL-VU® CBC is a disposable Hemacytometers used for manual cell counting. It consists of a dual-chamber glass slide, patterned from a printed inert surface. This surface supports two cover slips, each containing a laser-etched grid on the reverse side of the cover slip. 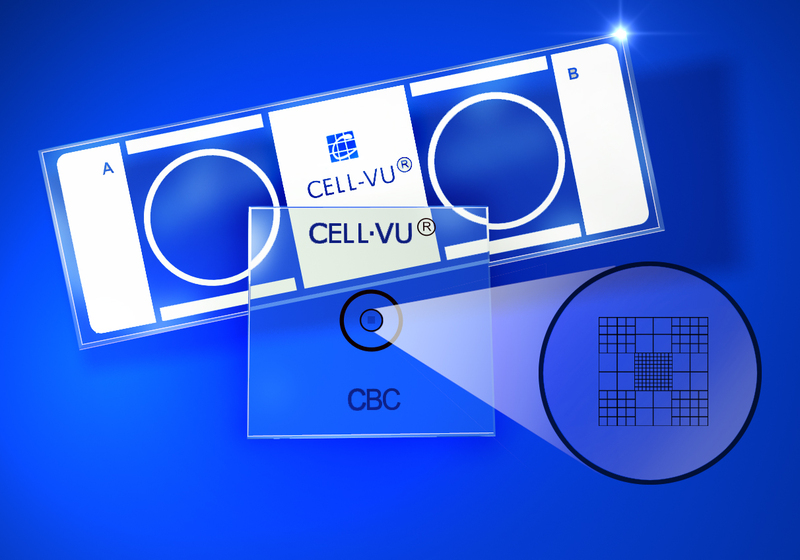 Two tests can be performed with each CELL-VU® slide. The CELL-VU® CBC grid pattern is a modification of the Neubauer Ruling. It consists of 9 large squares, each measuring 1 x 1 mm, giving a total area of 3 x 3 mm or 9 sq mm of counting area. The depth of the CELL-VU® chamber is 0.02 mm, giving a total grid volume for each chamber of 0.18 cu mm. The four corner squares are divided into 16 smaller squares (each 1/16 sq mm in area). The central square, used primarily for erythrocyte, platelet and sperm counts, is divided into 100 small squares (each 0.1 by 0.1 mm). The perimeter circle on the cover glass surrounds the CELL-VU CBC ruling. The total volume of this area is 0.5 cu mm. This area is primarily used for cell counts from low cellularity body fluids such as spinal fluid. Count the cells in the specimen. See directions below for the specific methodology and calculation for each type and condition of the specimen. Dilute blood using accepted laboratory methods. Disposable dilution preparations such as the UNOPETTE® system #5850 or #5851 can also be used. Pipette diluted specimen onto the CELL-VU® CBC slide according to the general preparation directions (above). After moving the coverglass into the final position, allow cells to settle for 1 to 3 minutes before counting. Isolate and view the CELL-VU® CBC ruling. Count the erythrocytes in the large center square of the CELL-VU® CBC ruling (this center square is divided into 100 smaller squares). Multiply the cells counted by 10,000 to obtain the total erythrocytes/cu mm. Dilute blood using accepted laboratory methods. Disposable dilution preparations such as the UNOPETTE® system #5856 can also be used. Pipette diluted specimen onto the CELL-VU® CBC slide according to the directions in general preparation. Count the leukocytes using 100x magnification. Count leukocytes in all 9 squares of the CELL-VU® CBC ruling. Multiply the number of leukocytes counted by 111 to obtain the total number of leukocytes/cu mm. Dilute blood using accepted laboratory methods. Disposable dilution preparations such as the UNOPETTE® system #5804, #5853, #5854, #5855 can also be used. Count the leukocytes using 100x magnification. Count leukocytes in all 9 squares of the CELL-VU® CBC ruling. Multiply the total number of leukocytes counted by 555 to obtain the total leukocytes / mm. Dilute blood using accepted laboratory methods. Disposable dilution preparations such as the UNOPETTE® system #5854, #5855 can also be used. For low platelets counts, count the platelets in the large center square as well as the four corner squares of the CELL-VU® CBC ruling. Multiply the cells counted by 1000 to obtain the total platelets/cu mm. Dilute blood using accepted laboratory methods. Disposable dilution preparations such as the UNOPETTE® system #5877 can also be used. After moving the coverglass into the final position, allow cells to settle for 10 minutes before counting. Isolate and view the CELL-VU® CBC ruling. Using 100x magnification, count the eosinophils in all 9 squares of the CELL-VU® CBC ruling. Repeat this count in the second chamber. Multiply the number of eosinophils counted by 8.8 to get the total eosinophil count/cu mm. If the spinal/body fluid appears clear (low cell count) pipette undiluted specimen onto the CELL-VU® CBC slide according to the direction in general preparation. After moving the coverglass into the final position, allow cells to settle for 1-3 minutes before counting. Count all cells within the perimeter circle found on the coverglass. This area consists of the entire CELL-VU® CBC ruling and the surrounding area. The total volume of this area is 0.5 cu mm. Multiply the cells counted by 2 to obtain the total cell count/cu mm. 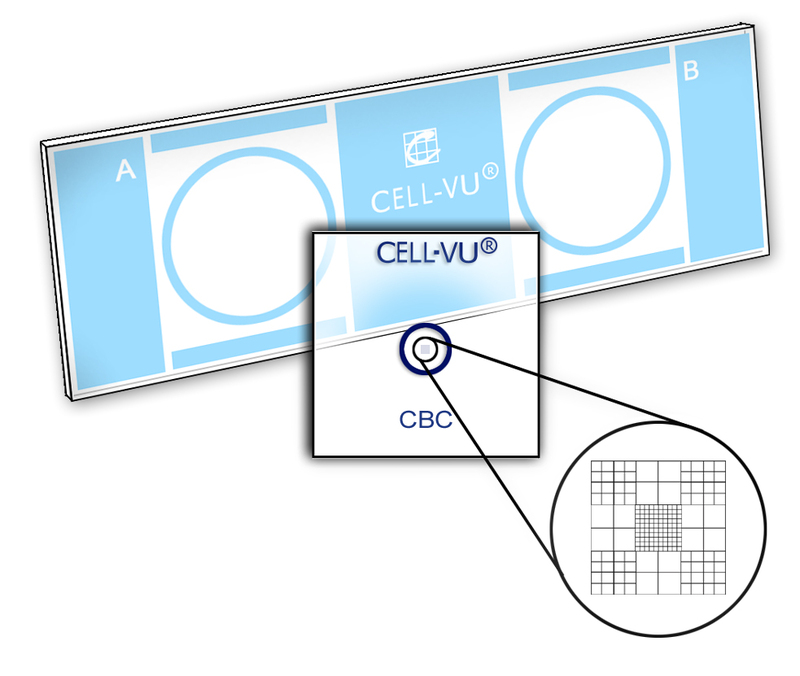 For spinal/body fluid that is moderately cellular, count the cells in all 9 squares of the CELL-VU® CBC ruling. Multiply the cells counted by 5.5 to obtain the total cell count/cu mm. For spinal/body fluid that is bloody (high cellularity) make appropriate dilution as previously described for manual hematology tests. Count all motile and non-motile sperm within 10 small boxes of the grid. Divide this number by 2. This result is the concentration of sperm in millions/ml. For specimens with low sperm counts, count all sperm within the entire central square (100 boxes). Multiply the count by 50,000 to obtain the total concentration of sperm/ml.